Home > Cisco Systems, Inc.
Found one file extension association related to Cisco VPN Client and 1 file format developed specifically for use with Cisco VPN Client. Simple to deploy and operate, the Cisco VPN Client allows organizations to establish end-to-end, encrypted VPN tunnels for secure connectivity for mobile employees or teleworkers. This thin design, IP security (IPSec) implementation is compatible with all Cisco virtual private network (VPN) products. 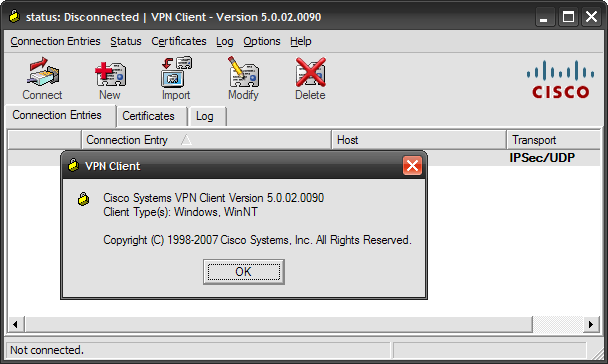 The Cisco VPN Client can be pre-configured for mass deployments, and initial logins require little user intervention. It supports the innovative Cisco Easy VPN capabilities, delivering a uniquely scalable, cost-effective, and easy-to-manage remote access VPN architecture that eliminates the operational costs associated with maintaining a consistent policy and key management method. The Cisco Easy VPN feature allows the Cisco VPN Client to receive security policies upon a VPN tunnel connection from the central site VPN device (Cisco Easy VPN Server), minimizing configuration requirements at the remote location. This simple and highly scalable solution is ideal for large remote access deployments where it is impractical to individually configure policies for multiple remote PCs. If you need more information please contact the developers of Cisco VPN Client (Cisco Systems, Inc.), or check out their product website.